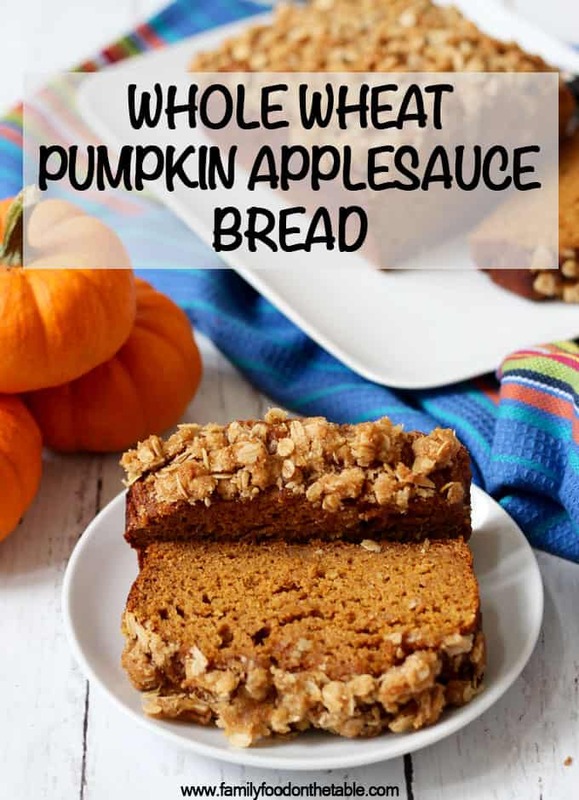 This whole wheat, naturally sweetened pumpkin applesauce bread has a crunchy streusel crust and is perfect for a fun fall breakfast or snack! 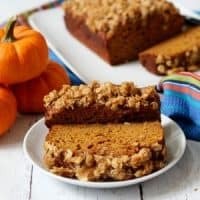 This pumpkin applesauce bread is super light but feels so decadent, thanks to the streusel topping. It’s like dressing up a casual outfit with some killer shoes – just sends the whole thing over the top! I have some killer shoes. They are gathering dust in my closet. Some of them are even stuffed under our bed, hidden and ashamed that they aren’t hitting the town anytime soon. I have kids ages 4 and 2. I have a full-time work-at-home job and preschool pick-up at lunchtime. Between work and snacks, we color and curl up and read books and build towers and play tag. Then it’s time to clean up and get dinner ready. I have no need for killer shoes at this point in my life. But I can’t possibly get rid of them. It could happen. We could have a date night where I actually fix my hair and pick out my outfit, including shoes, instead of grabbing at something in my closet between getting the kids fed and bathed and heading out the door, hoping I look passable. Every now and then, for a party or a girls night, I’ll wear a pair of my fun shoes. And I feel so fancy, so put together. It’s all good things – whole wheat, naturally sweetened with honey, and no butter or oil. OK, the streusel topping has butter and sugar, but not much, and it really makes this bread special. It’s great for breakfast, snacking or dessert. All times I’m probably wearing slippers. Sigh… those fun shoes will have a second lease on life at some point. 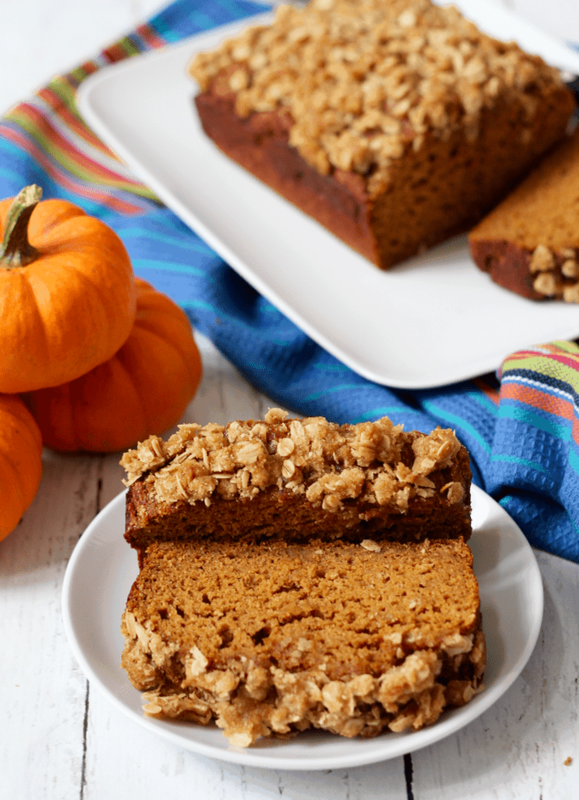 In the meantime, I’ll enjoy sharing some of this pumpkin bread with those little munchkins and be happy to have comfy shoes so I can keep up with them. Hope you give it a try, too. Also, do you have any shoes or other items of clothing you’re saving for “someday”? 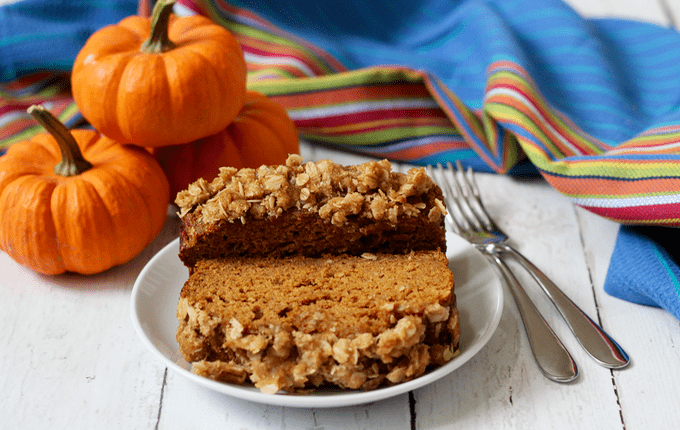 A light and healthy pumpkin applesauce bread with a crunchy streusel topping! For the bread: Mix the dry ingredients (flour through salt) together in a large bowl. In a separate bowl, mix together the wet ingredients (eggs through vanilla) and combine well. Sprinkle the streusel evenly over the top of the bread in the pan. This is such a perfect recipe for fall.. I do love a good quick bread this time of year! 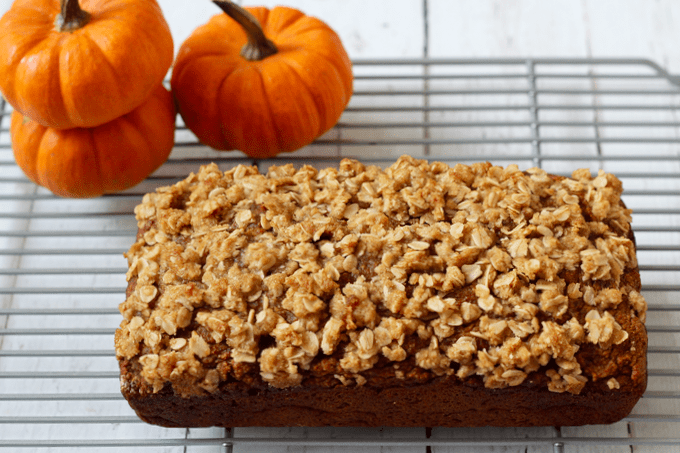 Pumpkins and apples does sort of scream fall 😉 I’m all about the quick breads – love some instant gratification, particularly when it comes to food! Thanks for stopping by! the fact that this has a streusel on top makes me want this 1000x more! Oh my goodness, this looks amazing! Hahahaha! I luv you, Kathryn.. you and your fancy big girl shoes! 😉 I have a shoe and hand bag obsession, so I can understand where you are coming from! It feels oh so nice to rock them when you can! Anyways, you must be a mind reader because I have a VAT of applesauce my MIL made for Boy in my fridge and I was thinking of using it for bread! This is PERFECT! LOVE the streusel topping, because yes to taking everything over the top! I can’t wait to try this! Pinned! Cheers, lovely! What is the calorie count for the Apple sauce pumpkin bread please? Hi Dawn! I’m currently in the process of looking at software to be able to add nutrition information to my recipes. I plugged this one into one of the programs I’m looking at, and it shows 150 calories per slice (for 12 slices in the loaf, including the streusel topping). Hope that helps and hope you give it a try! This is delicious!!!! The topping is to die for. So quick and easy too!!!! Thanks so much Celeste! The topping really does take it to the next level! Do you think it will affect the bread’s texture and/or cook time if I add cranberries? If so, what are your suggestions? Hi Mardi! Dried cranberries might be OK here – they have enough of their own sweetness and they don’t have any liquid that would affect the bread or baking time. You could try adding 1/4 to 1/3 cup and see what you think. I wouldn’t recommend using fresh cranberries. If you’re looking for a fresh cranberry bread recipe, I’ve got this whole wheat orange cranberry bread using fresh cranberries that you could try: http://www.familyfoodonthetable.com/whole-wheat-orange-cranberry-bread/ Happy baking! Sorry, I meant to also say in my last post that I didn’t make the streusel topping, hence why I added in the chocolate chips! 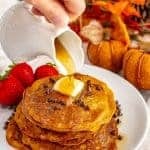 Came across this recipe on Pinterest as I had some leftover pumpkin puree from a chili I made. This recipe is fantastic! I truly feel it is healthy – minimal fat and refined sugar, loads of fibre and nutrients, and it turned out really well (perfectly moist!). It is not sweet – and that’s what I’m going for. I did skip the streusel topping (it did sound good, though!) to minimize the sugar content and just sprinkled some oats and pumpkin spice on top for show. Thanks for sharing this recipe, my friends and coworkers really enjoyed it. So happy to hear you tried it and enjoyed it Laura – thanks for letting me know!! 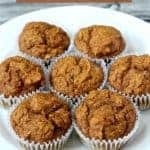 I have a child care center and we are using this recipe in comparison with regular pumpkin bread to show that things can be made healthier. Do you have nutritional facts for this , by chance? Hi Julie! So glad to hear you’ve tried it to share with some little ones – my kiddos love this! 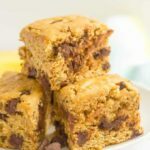 I plugged this recipe into a nutrition facts programs I’m looking at (because I may add nutritional info to recipes on my blog) and it shows about 150 calories and 3.4 grams of fat per slice (for 12 slices in the loaf, including the streusel topping). Hope that helps! I’m so happy to hear that Sherrie – thanks so much for sharing!! Yes! But I would recommend you freeze it without the streusel topping. Just made this and followed the recipe exactly ..it was perfect! I will add this recipe to my Fall Baking..thank you! Can i use a raw grated apple instead of applesauce? Hi Wanda! I always use unsweetened applesauce (the one I buy at Trader Joe’s is just apples, no other ingredients) but if you can’t find any easily, you could try it with some grated apple. I’m not sure it would be as wet. You can also sub a canola or vegetable oil or melted butter for the applesauce. Hope that helps! In Australia we don’t have Trader Joe’s. We do have the unsweetened applesauce at the organic outlets. I’ll have to check a few other supermarkets closer to home to see if it’s available. The bread came out delicious, very moist and tasty. I grated a very large Granny Smith apple, also added a dash of macadamia oil, perfect! The bread was totally refined sugar free….for the streusel topping i used Sukrin Gold which is a sugar free alternative to brown sugar. Many rave reviews by family and friends….Yummy! Hi Kristi! I know you can substitute regular all-purpose flour in a 1:1 ratio but I don’t have much experience with gluten-free/alternative flours, so I’m not sure what other adjustments might need to be made to the recipe. 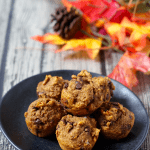 I love pumpkin … it’s a product that looks good on any recipe. Hi Sarah! I’m so glad you tried this recipe and enjoyed it! You can definitely let it cook a little longer if it’s not done. Oven times (and even altitude) can vary a recipe baking time from one person to the next. I’ve never had a baking soda taste issue… the honey in the recipe should help neutralize it. Not sure what made that happen! Yum! Thank you for this recipe. I made it on a whim this morning so I substituted grated pear for apple sauce and maple syrup for honey. My 1 and 3 year olds (and I) ate every crumb. The topping was so great and the moist bread was perfect. Thank you! I made this today and the bread is absolutely delicious. The crumb topping however easily falls right off the bread. Do you ever have this? Or do you press it down into the batter? I’m so glad you enjoyed the bread Jane! Yes, the topping is pretty crumbly and mine falls off a bit, too. But it does help if you push it down into the bread a little so that it bakes in some. Hope that helps! oh and by the way, welcome back from Costa Rica. Our family lived there for a year 5 years ago. ¡Pura vida! Hi Ivana! I’m not sure – I’ve never tried it that way. It seems like you would need to increase the recipe (1.5x? 2x?) 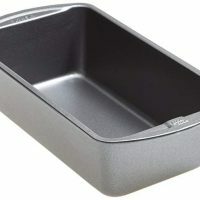 to make it fit in a larger pan. And of course, the baking time would probably need to be adjusted. Would love to hear if you try it though! I made this recipe and featured it in one of my youtube videos @ Diego and Hollie Ortiz. It was the balloon Fiesta vid. We really enjoyed this recipe. I ended up making two thinner loaves of bread. Thank you! Cool, and I’m so glad you liked it! I came here for the bread but loved LOVED the shoe struggle! Amen! SAHM of 7 year old and 3 three old twins. My shoes are patiently waiting too! This turned out awesome! I only had half of the honey needed so I subbed in real maple syrup for the rest of what was called for—still delicious and it didn’t make it maple-y at all. Hubby was surprised it’s whole wheat and (almost) refined-sugar free! I’m so happy to hear you both enjoyed this bread Kelly! And thanks for the notes on the substitutions – that’s helpful to know! 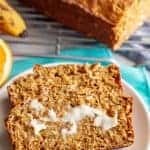 Can I use fresh ground soft white wheat In this recipe? I would think that would work Kris! Would love to hear if you try it! 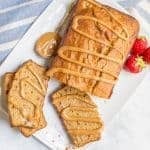 I am diabetic and can’t have honey, but would love to try this recipe can i use splenda instead? Hi Tina, I don’t bake with Splenda so I’m not sure how that would work quantity wise. 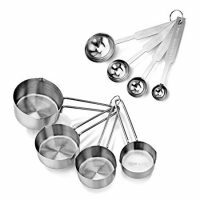 You would likely need to adjust the wet and dry ingredients as well. Sorry I can’t be of more help!